LAS VEGAS (December 17, 2016) - Tonight's final round of the 2016 "Knockout Night at the D" series ended in typical style as "Mighty" Aston Palicte won a 10-round split decision over previously undefeated "Lil'" Oscar Cantu in a terrific super flyweight match from start to finish inside the Downtown Las Vegas Events Center indoor facility. The Palicte vs. Cantu main event, as expected, was a classic match-up of contrasting styles between a dangerous puncher (Palicte) and consummate boxer (Cantu). There was surprising non-stop action from the opening bell. 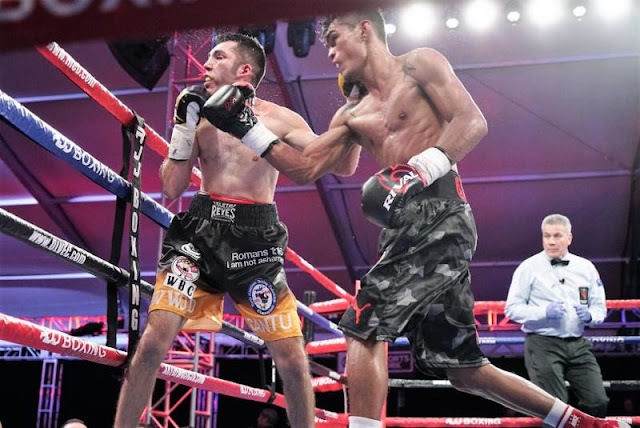 Power punching Palicte (22-2, 18 KOs) pressed the action as the clear aggressor, but Cantu stood in the pocket, too, as the technician used his defensive skills to make things difficult for his world rated Filipino opponent. Ultimately, it all came down to the 10th round, which Palicte swept on all three judges' scorecards for a hard-fought split decision victory by scores of 98-92, 96-94, 94-96. Palicte, rated No. 11 by the International Boxing Federation (IBF) and No. 15 by the World Boxing Organization (WBO), took Cantu's North American Boxing Federation (NABF) title belt in addition to capturing the vacant WBO Inter-Continental strap. Cantu, who is rated No. 4 as a flyweight by the World Boxing Council (WBC), showed tremendous heart, granite chin and the ability to move extremely well, throwing punches from every conceivable angle. The difference, however, proved to be Palicte's slugging ability in this classic confrontation in which the puncher barely prevailed against the boxer.